I’m delighted to welcome April Hardy back to my place today to help celebrate the launch of her new novel! Hi Jenny, thanks so much for letting me share my excitement with your readers. I’ll try not to waffle on too much and bore them all away! This time last year I was doing the edits on Sitting Pretty, which was to be my début novel. I was completely new to the whole editing process and, as I’m a 100% technophobe, must have driven my poor editor nuts with my silly questions! Whilst working on it I couldn’t help daydreaming about what it would be like to be a published author. Fast-forward a year and here I am, Friday 3rd March 2017, not only doing my first ever author session at one of the biggest and best literary festivals there is, but launching my second novel at it too. It really is a case of Excuse me while I pinch myself! The theme of this year’s Emirates Airline Festival of Literature is “Journeys”, and my own journey to this point started in January 2011, when my husband and I moved back to Dubai from Abu Dhabi. 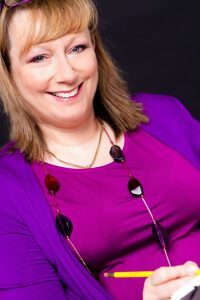 I’d been writing since 2008 – secretly at first, even my husband didn’t know – and, with no guidance or feedback because I wasn’t sharing my work with anyone, getting nowhere. And who knows how long that might have carried on if I hadn’t gone into Ibn Battuta, my new nearest shopping mall, by the entrance which took me past a huge branch of Magrudy’s bookshop having a closing down sale. I was sad to see another bookshop close, but that didn’t stop me buying so many books I needed a supermarket trolley to get them to the taxi rank. It was a mix of novels and writers’ reference books. I opened a random page of the first one I picked up and my eye was immediately drawn to an article on Winchester Writers’ Conference. It turned out there was another RNA member living in Dubai at the time, lovely Liz Fenwick, who kindly took me under her wing over many cups of tea in bookshop coffee shops. It was Liz who told me about the Emirates Lit Fest and so in 2012 I went to my first one, rushing from session to session like an excited puppy, absorbing as much writerly wisdom as possible. I even collared agent, Luigi Bonomi in one of the corridors to ask his advice on what I was working on at the time. In 2013’s festival I entered the Montegrappa Fiction Prize. I didn’t get anywhere, but three new friends, Annabel Kantaria, Rachel Hamilton and Linda McConnell, came first, second and third. But 2014 was lucky for me. Armed with the opening pages of two romantic comedies, Kind Hearts & Coriander and Hazard at The Nineteenth, I booked two Quick Pitch sessions with Luigi Bonomi. I also entered both in the festival’s Literary Idol competition. Cutting a long story short, Luigi liked Kind Hearts and we arranged a meeting which ultimately led to my being signed by his agency. And, championed by Judy Finnigan, Hazard at The Nineteenth won Literary Idol. I couldn’t stop grinning for a week. All I had to do now was finish writing them! As you can imagine, 2014/15 flew by in a flurry of writing and rewriting, and the excitement went up a further notch when, in August 2015, I was signed up by Accent Press. The subject of one day being an Emirates Lit Fest author myself was broached – ELF and its sister organisation, Dubai International Writers’ Centre are very supportive of the family of locally based authors they’ve helped nurture over the last nine years. The 2016 Lit Fest saw me, like one of the Bisto Kids, nose pressed against the glass, thinking “This time next year … This time next year …” But there was still plenty to do before then. Sitting Pretty had to be edited and, when it came out we had a launch in London and another in Dubai, which might seem a tad greedy but we had so much fun! And I like to think I was better prepared when it came time to editing Kind Hearts ready for e-book publication in January. And here we are, Friday 3rd March 2017. A very important point in my writing journey. Today I’m not a Bisto Kid. Today I get to be one of the authors up on the platform. Today I get to sit behind one of the tables in the book signing area, and see not just the one I expected, but two of my books on sale on the bookshop area. Oh, and the bookshop in question? Magrudy’s! Magnificent Magrudy’s! I love that shop! April Hardy grew up on the outskirts of the New Forest. After leaving drama school, her varied career has included touring pantomimes, children’s theatre and a summer season in Llandudno as a Butlins red coat. All interspersed with much waitressing and working in hotel kitchens! After moving to Greece, she spent many years as a dancer, then choreographer, and did a 7-month stint on a Greek cruise ship before working for a cake designer and training as a pastry chef in a Swiss hotel school in Athens. Whilst living there, she helped out at a local animal sanctuary. 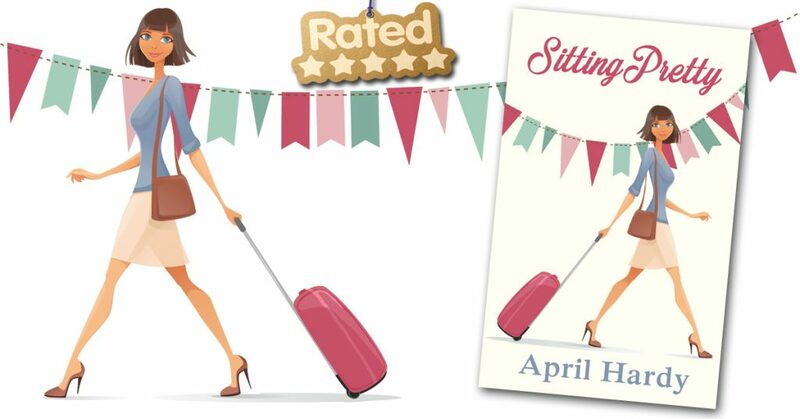 Relocating to the UAE with her husband and their deaf, arthritic cat, she has lived in both Abu Dhabi and Dubai, where she is delighted to have found herself so unemployable that she’s had plenty of time to devote to writing her romantic comedies! At the 2014 Emirates Lit Fest she won the inaugural Literary Idol competition with the opening page of Hazard at The Nineteenth. She also had a successful Quick Pitch session, showing Kind Hearts & Coriander to agent, Luigi Bonomi, whose agency, LBA Books went on to sign her up. In 2015, she signed a 3-book deal with UK publisher, Accent Press. Sitting Pretty was her début New Forest rom-com. 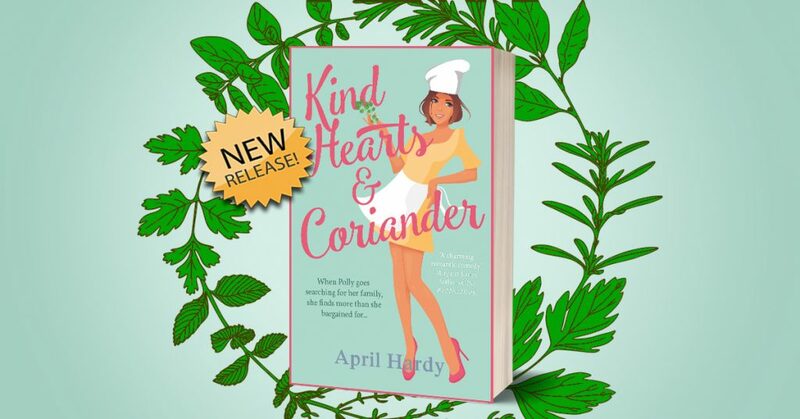 Kind Hearts & Coriander has just been published and Hazard at The Nineteenth is due out later this year. What a great article! Congrats on the new book, I’m very excited for you, and can’t wait to read it. I read Sitting Pretty and loved it!